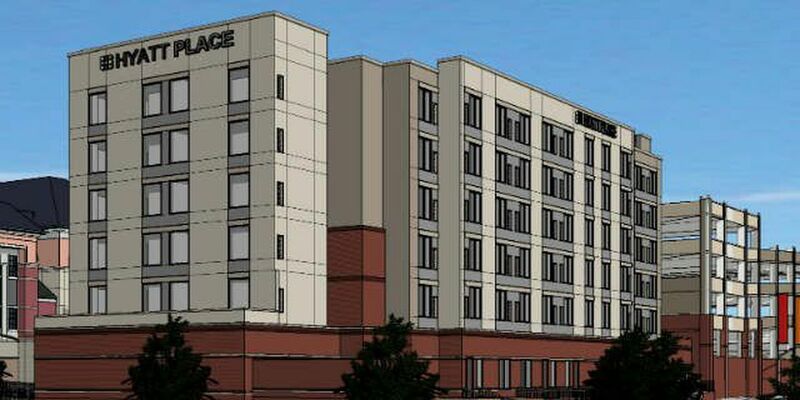 LYNDHURST, OH (WOIO) - First Interstate Properties, Ltd., the developer of Legacy Village, is announcing plans to expand by adding a six-story, 135-room upscale select service Hyatt Place hotel. The plans also include a new five-story, 355-car parking garage. First Interstate will submit plans to the City of Lyndhurst in the coming weeks for approval. Both buildings would be developed in the north parking area. "Even a distinctive, successful shopping and dining complex such as Legacy Village – like any business – needs to grow, invest and smartly expand to help ensure future vibrancy," said Mitchell Schneider, President of First Interstate Properties, Ltd. and the developer and Managing Member of Legacy Village. "We are excited to be growing with this hotel addition." "Legacy Village is the largest taxpayer in the City of Lyndhurst," he added. "This project will add another high quality dimension to Legacy Village and help position it for continued success far into the future. It will allow business and leisure travelers to remain on the property and enjoy the diverse shopping, dining and entertainment venues." Schneider expects construction to begin early this spring with the hotel opening anticipated before June of next year – in time for the 2016 Republican National Convention, which will demand the use of hotel rooms throughout Greater Cleveland. Plans for the project have been shared with officials from the City of Lyndhurst and the South Euclid Lyndhurst School District. The $33 million project is expected to create 20 full-time jobs and 60 construction jobs. The City will realize new income tax and bed tax revenues while the school district will also benefit. The new Hyatt Place will be designed to meet the needs of business and leisure travelers alike with three meeting rooms that can be combined into a space of approximately 1,800 square feet, an indoor pool, an on-site fitness center and a "Coffee to Cocktails" bar that will be open to serve food and beverages to guests and other patrons of Legacy Village from early morning through late night. Hotel guests will also have access to spa and salon service providers, restaurants and bars, and fitness facilities at Legacy as well as the Acacia Metropark Reservation across the street. The proposed parking deck will be connected to the main street at Legacy Village via an enclosed passageway that will be developed at the retail space now occupied by Spruce, which will be closing in mid-February 2015. "We have dreamed of bringing a hotel to Legacy Village for many years," said Schneider. "One substantial obstacle has always been the cost of the structured parking garage that would be required in order to replace the parking spaces on which the hotel would be situated. We are grateful to the City and the South Euclid Lyndhurst Schools for working together with us to create a 'win–win' situation with Tax Increment Financing (TIF) to offset the cost of the required parking garage. If it wasn't for this TIF agreement, this significant project would not move forward. The City of Lyndhurst and the School District are in discussions with Legacy Village regarding the TIF financing arrangement. The matter will be considered at a District Board meeting and by Lyndhurst City Council on Monday, March 2. "Legacy Village is crucial to the well-being of the City of Lyndhurst", said Lyndhurst Mayor Joseph Cicero. "Bringing a high quality hotel to Legacy is perfectly aligned with the community's interests. First Interstate Properties has been a wonderful partner to the City of Lyndhurst and we agree that adding this new dimension to Legacy is a terrific plan. With new jobs and tax revenues, the City's residents will benefit from this project for years to come". The South Euclid Lyndhurst School District is also participating in allowing the TIF to be placed on the new hotel in order to support the garage structure. "We understand that this hotel would not move forward without a public – private partnership to fund the garage structure," said Linda Reid, Superintendent of the South Euclid Lyndhurst Schools. "The School District would benefit from this project for years to come. We are discussing the possibility of the TIF and the developer providing seed funding for the South Euclid Lyndhurst Schools' launch of its new health careers technical program." "This jumpstart funding, as well as guaranteed continued revenue from additional sources that would be provided for via the TIF documents, could allow South Euclid Lyndhurst Schools to adopt a true 21st century, forward-looking vocational training program for our students and those in surrounding communities," Reid added. "We are excited that Legacy Village is successful and is continuing to grow. Legacy Village is an important partner and tax generator for the District and it is important to the community, and in particular the students, to do everything we can within reason to ensure its continued vitality and value." First Interstate Properties is working with the Cleveland-Cuyahoga County Port Authority on the bond financing that will help make the project possible. It is expected that the Port Authority Board of Directors will take up the financing at their March meeting. The Port is being asked to issue $13 million in bonds to finance the garage and $15 million to assist in the development of the hotel.